When the fifth-generation 1997 Corvette was unleashed, no one could have predicted the effect its new LS1 V8 engine would have on the aftermarket and hot-rodding community. The LS1 was the first of a new generation of compact and powerful LS engines which packed ample performance and great efficiency into a relatively small package. As more variations of the LS engines trickled out, more and more performance enthusiasts began to gravitate towards them, dropping them in almost any hot rod, muscle car and sports car they could fit it in, which as it turns out, is quite a lot. Some mechanics have become quite well versed in dropping the LS V8 in the engine bay of cars which were never meant to house an eight-cylinder engine, like the Mazda Miata. 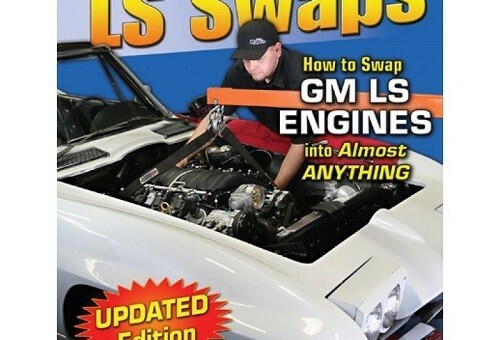 But for those which may be new to the practice, there is the “How to Swap GM LS-Series Engines into Almost Anything” book, which as you may have guessed, will teach you how to swap a GM LS-series engine into almost anything. The ad for the book on eBay claims it will give you a historical review, complete specs, and detailed information on the LS-series engines so you can choose the best fit and most appropriate LS engine for your application. The section on mounting kits explains how to install an LS engine into a variety of cars using pre-made motor mount kits, universal engine mounts or mounts which you fabricated yourself. It will also show you how to perform oil-pan modifications and choose the most suitable fuel pump, exhaust system, wiring harness, and electronic control module for your project, among many other things. Looking to create you very own ‘BRZ06′? Building a Pro Touring restomod Camaro? No matter what your goal, How to Swap GM LS-Series Engines into Almost Anything will probably have you covered. Check out the ad for the book here. As of this writing bidding sits at $20.55, with 10 other LS-engine enthusiasts having bid on the book so far. *Except any car in California. I can’t see how unless you’re an automaker. You aren’t allowed to even with an FTP-75 EPA Certificate of Conformity. That only applies to direct-import (foreign) cars, not to modified cars. It’s easy to laugh at, unless you live in it. Most people that do it here nowadays have vacation homes in Vegas and just leave the cars there 50.1% of the time. I could understand a government that wants carbon offsets, or just flat out payments. The government we have in CA just likes to say no.